Will A Solar Powered Pure Electric Car Ever Hit The Road? Home/Electric Car Benefits/Will A Solar Powered Pure Electric Car Ever Hit The Road? 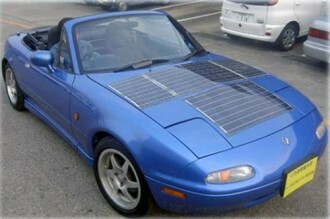 Though the concept for a solar powered car is there, a practical car powered by solar cells is yet to be manufactured. To produce a car that works on solar power, the technology to harness and store solar energy has to develop further. The Photovoltaic (PV) solar cells which we use today can produce energy but the problem is its storage. The weight of the car is another problem. As the weight of the car increases, more energy will be needed to move it. If solar cells are going to be installed on a car, the car needs to be extremely large since the PV panels occupy lot of space. A large car will naturally have more weight. Then there are the deep cycle batteries which add more weight to the car. A pure electric car will have a series of batteries stored inside the vehicle. The entire battery storage system setup can be quite heavy. When we include the weight of the passengers and the driver, the car becomes quite heavy and it will be difficult to install so many solar cells to produce energy sufficient enough to move a heavy car. So what does this means? Well, it means that a solar powered vehicle will remain just a dream as long as the technology to produce and store the energy generated by the PV cells doesn’t develop further. Increasing the energy production capacity of individual solar cells and decreasing the size of power storage batteries are some of the developments that should take place in order to a solar powered car to become a reality. It is estimated that if each Photovoltaic cell doubles its energy production and that the weight of batteries could be reduced by half, a solar powered vehicle will hit out roads in only a couple of years. Developments in nanosolar technology have given hope to solar powered car enthusiasts. Unlike the traditional solar cells, nanosolar technology uses a spray of solar cells and the spray can be applied all over the body of the car. The spray contains very tiny solar cells which are capable of converting solar energy into electrical energy. These nano solar cells are infrared sensitive and so can utilize infrared rays from the sun to produce energy even when the sun is covered by clouds. These dot-like solar cells can be installed on the car by mixing them with the car paint. Irrespective of the weather conditions, the nano solar cells will go on producing power to charge the batteries on the car. Though nanosolar technology can produce more energy, but the problem of weight still remains unsolved. The heavy batteries have to be there to store the power produced by the nanosolar cells. Efforts are on to increase the solar power output by spraying these solar cells on to windows of vehicles and homes. American scientists are investigating into the possibility of producing solar power on a large scale by installing a large number of PV panels and storing the power for use in electric vehicles throughout the country. This is a feasible project as the technology to produce and store solar energy already exists. What does not exist is awareness among people and government that solar energy is a viable source of clean and renewable energy that can be put to different uses.